The advent of the high-bypass-ratio turbofan engine led to a significant step-change reduction in noise from jet engines, principally due to lower levels of jet noise. A consequence of this reduction in jet noise is that, relative to other sources, the fan noise is a major contributor to the total noise from modern turbofan engines. 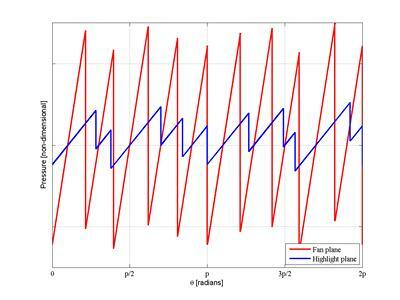 In most modern turbofan engines, at high engine power operating conditions, the fan tip rotation speed is supersonic. 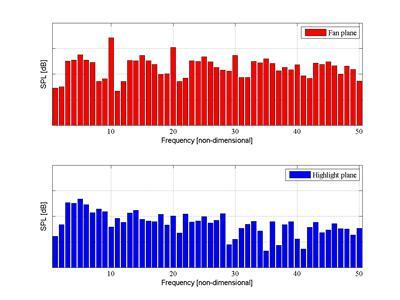 The noise spectrum from a supersonic fan is very different compared to a fan that is rotating subsonically. Supersonic fans produce a multitude of high-amplitude tones at harmonics of the engine’s shaft rotation frequency. These tones are known colloquially as the “buzz-saw” noise. Developing state-of-the-art “buzz-saw” noise prediction schemes is the key objective of the work on this project. Modelling the noise from aircraft engines is highly complex. A common approach to ease the modelling complexity is to separate the problem into three parts: (1) Noise source generation; (2) Sound propagation inside the engine; (3) Sound radiation from the engine. In the case of supersonic fan (buzz-saw) noise, the prediction of the noise source from a supersonic fan is possible utilizing advanced computational fluid dynamics (CFD). However, to date, CFD is only used for part (1), and it is not viable to use for parts (2) and (3) as well. Accordingly, the work on this project is focussed more on the propagation and radiation of supersonic fan noise. Owing to the high sound pressure levels generated near the fan, inside the turbofan intake duct it is necessary to use a nonlinear acoustic propagation scheme. 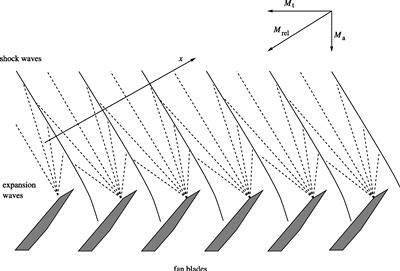 Accurate prediction of supersonic fan (buzz-saw) noise is a challenging problem in aeroacoustics because the analysis involves nonlinear acoustics, modelling a complete fan blade set, modelling an acoustic liner and calculations at high frequencies. Research at the ISVR has led to the development of an engineering model which simulates the pressure field (inside the intake duct) that is generated by a supersonic fan. The pressure field in the rotor’s frame of reference, close to the fan blade tips, is comprised of a series of shock waves attached to each rotor blade. Around the intake duct, this pressure signature is a sawtooth waveform. Owing to small blade-to-blade differences, the corresponding amplitude spectrum contains tones at all multiplies of the engine shaft's rotation frequency, albeit close to the fan the blade passing frequency harmonics will be the dominant tones. At supersonic fan speeds, this sawtooth waveform can propagate upstream against the oncoming flow. The propagation is nonlinear: acoustic energy can be transferred between different tonal frequencies through nonlinear interactions. Near the intake's highlight, owing to the nonlinear effects, the pressure sawtooth's irregularity will have escalated, and the corresponding amplitude spectrum will have a spectral shape dominated by low frequency tones, with the blade passing frequency harmonics no longer the dominant tones. The nonlinear propagation of an in-duct sawtooth pressure signature can be simulated by an engineering numerical model which has been developed at the ISVR. The results can be used to estimate the in-duct "buzz-saw" noise levels. 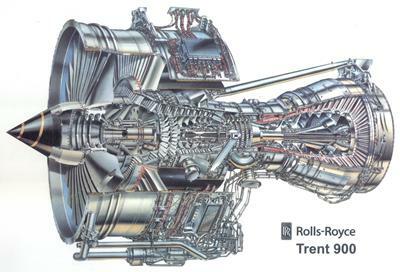 This code is now used by the Rolls-Royce Noise department. Future areas of work include investigating the use of two- or three-dimensional nonlinear propagation models (the current state-of-the-art employs a one-dimensional scheme), modelling more realistic mean flow effects, and improving how to model the effect of the acoustic lining on "buzz-saw" noise attenuation (modern intake ducts are acoustically lined to reduce fan noise). This work has been funded by the European projects DUCAT and RESOUND. Also funding has been provided by Rolls-Royce plc and the EPSRC (via the Dorothy Hodgkin Postgraduate Award scheme). By A. McALPINE and M.J. FISHER. Journal of Sound and Vibration, 248(1):123–149, 2001. Journal of Sound and Vibration, 265(1):175–200, 2003. By A. McALPINE, M.J. FISHER, and B.J. TESTER. Journal of Sound and Vibration, 290:1202–1233, 2006. Journal of Sound and Vibration, 306:419–443, 2007. By A. McALPINE, P.J.G. SCHWALLER, M.J. FISHER, and B.J. TESTER. Journal of Sound and Vibration, 331:4901–4918, 2012.